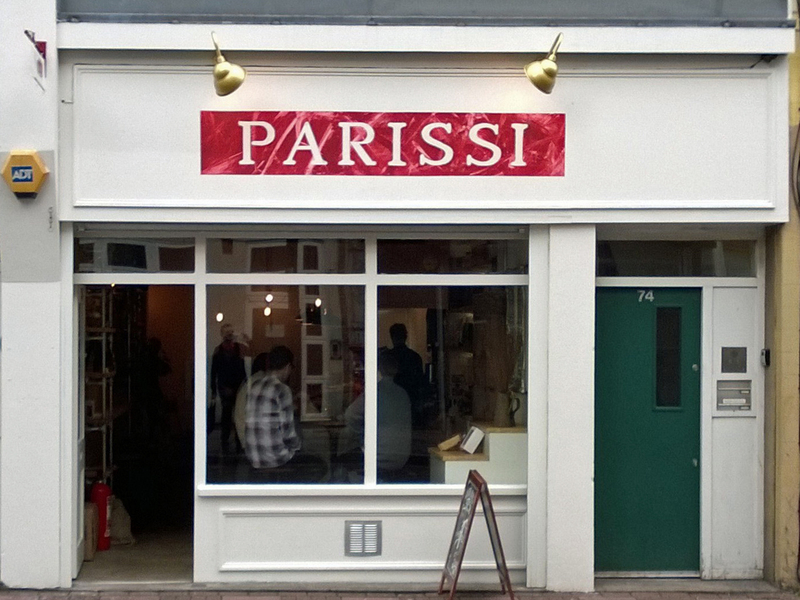 Parissi is a relatively new café on Atlantic Road, just before it becomes Railton Road. It is a bit of a Tardis with a small shop that opens out to tables at the back. As you enter you pass a counter on the right loaded with home-made pastries and sandwiches. At the back is a large table with benches at which you could easily seat 12, or 14 at a bit of a squeeze and other smaller tables if you’d rather eat tête-a-tête. The large table is promoted as being ideal for meetings or even a private event, although it’s also fine for individual diners. The owner and inspiration is Spyros Parissis. He’s Greek by origin and a marine biologist by training but has always loved cooking. You can read much about how he came to establish a café in Brixton in the couple of items on the Brixton Blog; see here and here. The café opens early for breakfasts of toasties and small plates, described as mezze, for lunch. In the evening, it becomes more of a nightspot with cocktails and, sometimes, music. The commitment by Spyros is demonstrated by the ferocious hours he is prepared to work, particularly when you realise that he does all his own baking. We’ve visited a few times, but only for lunch, so we have no idea of the evening ambience (although Facebook suggests interesting events). The food is eastern Mediterranean in approach. There are also sandwiches made from sourdough bread from Bad Boys’ Bakery, which is excellent. The toasted bread comes in a brown paper bag that keeps it warm. My favourite dish is the babaganoush – a sort of smoked aubergine pâté with tomato, olive oil and garlic – although it might not be to everyone’s taste. I’ve also enjoyed the Italian sausages with potatoes and peppers in a mild chili sauce. It’s worth emphasising that the mezze portions are small and like a generous sandwich filling. 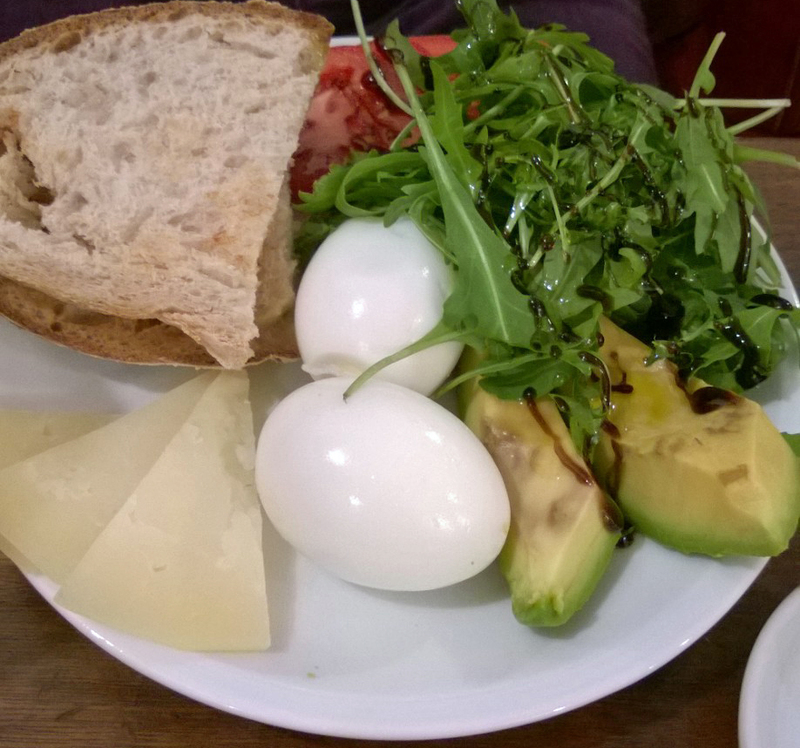 There are also breakfast dishes, although the only one we’ve tried (pecorino cheese, hardboiled eggs, avocado and salad) was just a bit uninteresting. 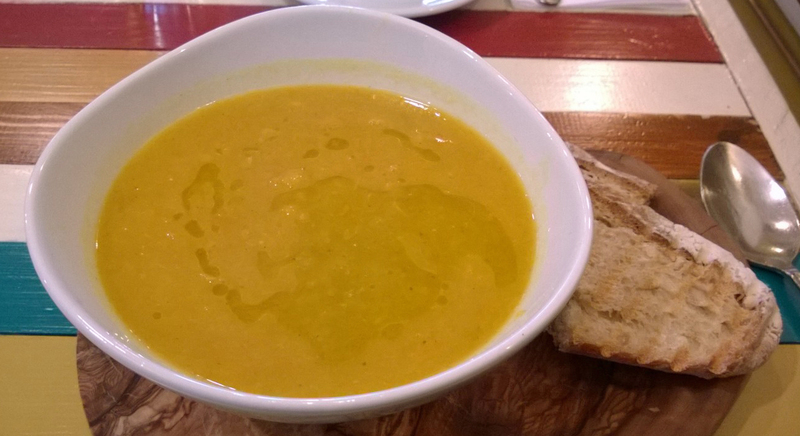 In addition there’s always a soup of the day – the accurately spiced squash and lentil version was tasty, especially for a cold day. Finally, there is always the selection of freshly made croissants, brioche, cakes and tarts, all of which are made in-house. I’ve only had a nata, i.e. 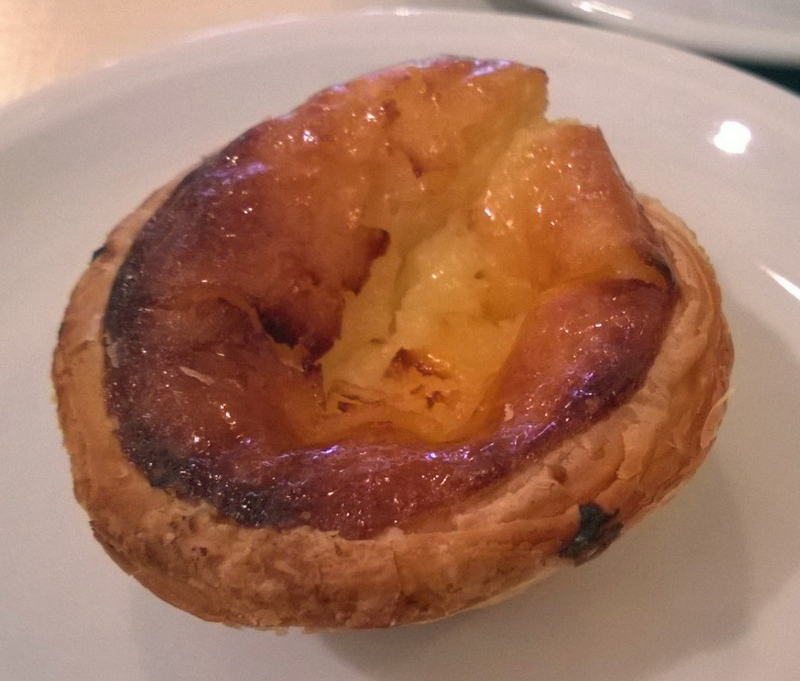 a Portugese style custard tart, which had just the right amount of caramel taste and I had to stop myself going for two in this January austerity month. To drink there’s the usual selection of coffee and teas and I’m happy to report that the coffee has always been fine. 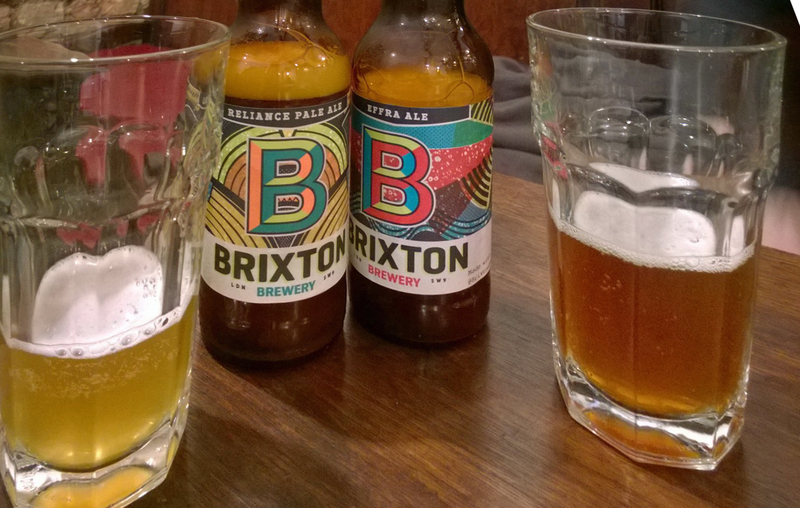 As they have a licence there’s a selection of beers mainly from Brixton Brewery. We don’t drink regularly at lunchtime but from the photograph you can see we felt obliged to try a couple on your behalf, even though our first choice of a Windrush Stout wasn’t available. The prices are much in line with similar places in Brixtion – most of the mezze were £5.00; the soup was £4.50; and the nata was £1:80. An Americano coffee was £2.20 and the Brixton bottled ales were £3.70. 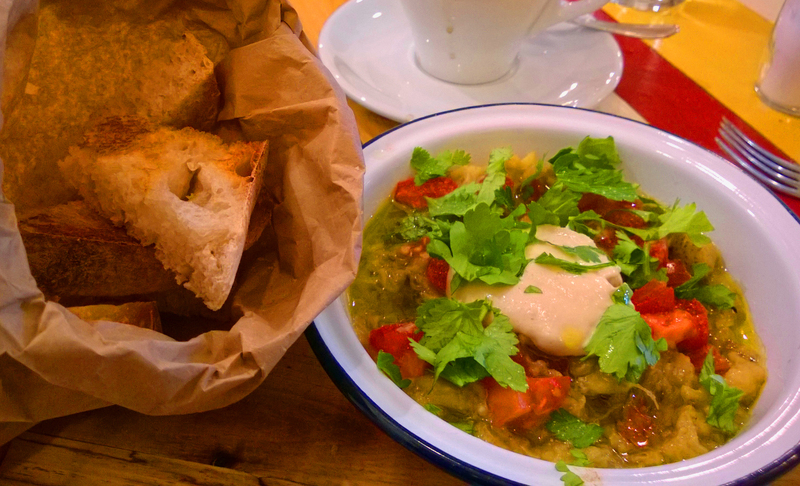 We think that Parissi is a great addition to the growing list of places to eat in Brixton. It’s a bit out of the centre and not that well placed to capture passing trade, but it is trying that bit harder than other places to become a destination in its own right.